"Did you hear that?" your friend asks softly, a worried expression blanketing her face. You did, indeed, hear the sound that seemed to surround the two of you, but decided to brush it off. "It's probably just the wind, Casey," you reply, although goosebumps are racing up your arm. She nods and trains her flashlight on the trees surrounding you both. With every step you take, you can't help but wonder how the night turned so quickly. At the strike of twelve, you had arrived at a party. You didn't know whose it was, but it appeared as if the whole town was invited. You had decided to drag Casey along for company even though you knew she hated parties with a passion. Minutes tick by and beverages are poured until you find yourself in the midst of a crowd sitting in a circle. The classic game of truth or dare had been suggested, and everyone was game. You couldn't find the person who'd invited you, some guy in your calculus class, but it didn't really matter. You were having a grand time. As the turns went on, it seemed like everyone knew everyone, except for you and Casey. You two were the black sheep and stuck out like a sore thumb. Sure, you had had a few drinks, but the girl handing out the questions and dares had had many, many more. For some reason, someone had selected you, and foolishly, you chose dare. You consider yourself a brave person and thought you had this, one hundred percent. "You," the girl said sloppily, strands of her hair falling out of her bun and resting on her shoulders. The crowd turned to look at you. You could feel the pairs of eyes staring dauntingly, wondering what Miss Blondie had in store for your poor soul. "I dare you to spend the night in the woods." The crowd collectively gasped, and you completely understood why. 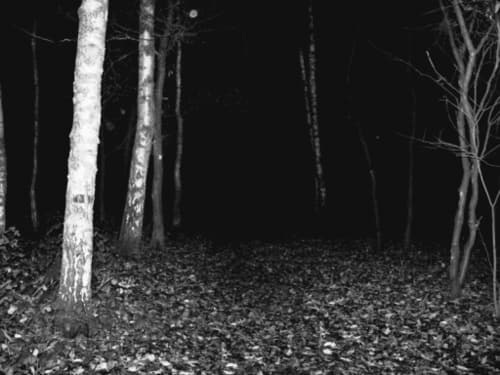 No one goes in the forest at night, and those who do are never seen again. So many myths and rumors started flying in the early 90s after two, then five, then ten people went missing in the span of eight months. Everyone in this town believes the woods are haunted, and you're one of those many people. Gulping, you pushed down the anxiety rising in your throat and glanced at Casey. Her eyes were wide with fear when she met your gaze. You couldn't dare to ask her to come with you because you'd already done enough by bringing her to this party (which you now regretted coming to). But Casey was a kind soul and shakingly offered to accompany you. So that's why you're here now. Trembling and weaving through dark underbrush and trees. At least the party-goers were kind enough to lend you flashlights and jackets, but no food. People can be very, very cruel. "What time is it?" you ask, your voice rasping. Casey glances at her watch, the face illuminated by the full moon. Her black hair cascades over her ear after her failed attempt to tuck it back. "3 AM. We have four hours left." You would sigh with relief because, in the three hours you've been out here, you haven't seen anything. But anything can happen in four hours. It almost feels like you're going in circles. You're starting to get nervous, for the night is silent. Too silent. It's creeping you out. You go to look back at Casey for some reassurance, ready to admit that you can hear the sound too, when you realize she's not there. She's gone. You're confused out of your mind. Where did she go? Turning in a circle, you see no sign of her. No glint of a flashlight, no shimmer of her raven hair. She's gone, but how? "Casey!" you shout, but are met with nothingness. Your breathing becomes shallow. She has to be here somewhere. She has to. But... but.. she's been with you the whole time. There's no way she'd get lost. Your thoughts are cut off by a blood-curdling scream that sounds exactly like Casey. You run towards it, the pale moonlight as your guide. The canopy of trees and leaves are making you feel suffocated. You need to find her and leave. Now. Screw the stupid dare. You jump over branches and trip over stones when you arrive in a clearing. You start walking forward when you're blinded by a flashlight. I'm not a very good writer but enjoy it immensely. This profile will most likely contain random short stories. Reed Alexander's Horror Review of "Puppetmaster (1989)"